Years ago when I started my own literature review, I read a metaphor on a doc student’s blog that really resonated with me, and it may with you too. 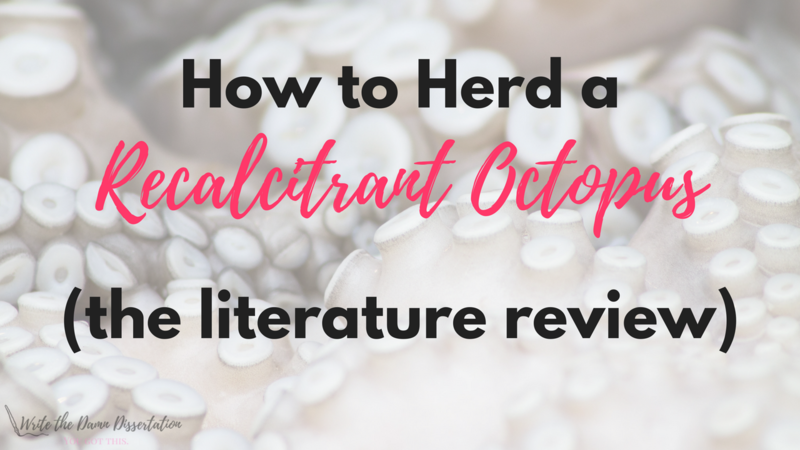 The author said something to the effect that the process of writing the literature review can feel similar to herding a recalcitrant octopus, which then transitions into having a turangawaewae moment… finding a place where you belong, and of having a place to stand on and to speak from. I loved this metaphor because the process of conducting the literature review is an exhaustive step in the dissertation journey. It can’t be rushed, is very time consuming, but once you have “herded” it, you have a solid foundation from which to build the case for your research. It’s a labor of love. The literature review is a lot like telling a story about how every other researcher has made progress, but you are identifying a gap in the knowledge base and identifying specifically what that gap looks like. It critiques major articles on a very narrow topic. It uncovers major concepts and theories which shows the relationships between those concepts. It is about critically reading the empirical research in your field, and builds the necessity for your study. What is the purpose of the research? What research has been conducted in the past on your topic? What theories exist on your topic? What is the relevance of past research? Are there any agreements or disagreements among the existing research? Are there any flaws in the research? What are the recommendations from other researchers? It is important to approach the research in an organized, methodological manner. There is no easy way around the literature review. It can’t be rushed and must be thorough. The easiest way to write a literature review is by reading A LOT of dissertations. Take advantage of utilizing the gold in the references section of each dissertation relevant to your topic. When plugging in information and adding notes to your spreadsheet, be sure to identify strengths and weaknesses in the study. The literature review is the act of identifying the gap in the literature that your research will fill. Consider the literature review as your opportunity to build your case. Taking detailed notes throughout the entire research process in an organized and consistent manner will put you in a great position when you start the process of writing. Download the template here and customize to suit your needs. So what do you think of the octopus metaphor? What metaphor would you use to describe the literature review? Please share! Wishing you success and well-being on your doctoral journey.